We all think we know about food allergies and sensitivities. I mean how can we avoid it these days, right? Everywhere you look things are labeled “gluten free”, “dairy free”, “made in a facility with nuts”. So what is happening and how can we stop it? Food allergies are on the rise with 1 in 13 children affected. You may assume that if you are healthy your child is not at risk. Unfortunately, every baby is at risk. In fact, over 50% of children with food allergies have no family history! Infants with eczema are at the highest risk for developing food allergies, with 30% developing food allergies, compared to baseline rate of 8% and a rate among babies with a family history of 11%. As a parent, those percentages are scary! Especially when my other half, and half of my baby girl’s gene pool, has a food allergy. My husband has a mild nut allergy. While we typically don’t have a hard time going out to eat and he can be in the same room as someone eating nuts – which makes my life easier because like how do you live without nut butter?! – I have seen first hand what it is like when we do have an issue. I have been there when my husband got something that we didn’t know had nuts in it. I have worried seeing him get extremely sick from eating a nut product. I have had to taste test sauces when we got take out and be the one to make the call of whether I thought there was nuts in it. Recent landmark studies (LEAP, EAT, PETIT) have proven that exposing babies to food allergens early and often can reduce their risk of developing allergies by 67–80%. Research methods included early allergen introduction starting at 4-6 months of age and sustaining exposure multiple times a week for several months. However, many infants are not developmentally ready for solid foods at 4 months and are often picky eaters, making it difficult for parents to sustain exposure and follow these study methods. So what now? Thankfully, in my pursuit to find the best way to give my baby girl a chance against a nut allergy, I found Ready, Set, Food! This company offers a groundbreaking, all-natural solution to make the introduction of allergenic foods easy, safe, and affordable for all families. They produce pre-measured daily packets that can be added to breastmilk, formula, or food, allowing families to easily introduce allergenic foods to their baby on a regular basis starting at 4 months of age. The sequential and step-wise system gradually exposes infants to peanut, egg, and milk, which make up more than 80% of childhood food allergies. We are on Day 5 of our intro days with my little sweet pea and I can truly say this program has made introducing allergens EXTREMELY easy and much less scary than I could have ever imagined. Because I feel so strongly about the need for more parents to educate themselves on child food allergies, I want to share this great company with all of you! Want to learn more about this all-natural and easy approach to early allergen introduction? For a limited time, you get this special offer extended just to my followers! Visit Ready, Set, Food! and use code “FITNESSFORREAL20” to get $20 any subscription! Your little ones depend on you to give them all the tools they need. Do this for them. I’m Not Superwoman. I’m a Mom. Moms do everything for their kids, their families, and nothing for themselves. Moms don’t have any needs of their own. … That is until they don’t. Moms are superheroes. That is the image that we perpetuate. Moms are these beings who can somehow get no sleep and still be fit, feed their families healthy meals, care for kids (and sometimes pets), clean the house, do the laundry, run the errands, look pretty, and stay sane all at the same time. They can drain themselves, run on fumes, and not even blink. We give them a title like “superwoman” thinking we are giving the highest of compliments. But what if we’re not? In today’s society we are no longer keeping up with the Joneses. We are keeping up with the Joneses, and the Williams down the street, and the Edwards from high school, and the Smiths across the country, and the Johnsons we’ve never even met but their house always looks spotless in every IG post so if they can do it we can too. We push, we pull, we pour. We go, go, go. We put a pressure on ourselves to be better than our best and to always impress. But at what expense? One of the lessons I am constantly teaching clients I have worked with in my mental health jobs is that you can’t pour from an empty cup. People will “yeah yeah” you to death when you talk about this concept but never actually listen or think about what that means. Moms are the biggest culprits. During my journey through pregnancy, I was constantly pushing myself to keep up. I didn’t want to succumb to the trials of pregnancy. Until the last two weeks came and I was broken. I was so exhausted I needed it to be over. And when it was I was overly eager to get back to myself. I was a week in and trying to clean my house spotless for newborn photos. I was waking up every 2 hours all night to feed my newborn but I didn’t want to take a nap during the day because it felt lazy. Everyone around me was telling me to relax and encouraging a nap. I had family surrounding me all willing to take my baby for an hour so I can catch some Z’s but I felt like allowing them to do that was just me passing off the responsibility of caring for my child onto them. It’s my baby. I am the mom. I should be able to do it all. I don’t need sleep right? At least that’s what I had been told for the last 9 months. All over social media we see memes and posts about what it means to be a mom. About the schedules that only moms could handle. We are basically encouraged to ignore our own needs. You’re a mom now. You don’t have needs anymore. Having needs is selfish. The issue with this is that our needs don’t go away. Physically the human body needs sleep to be healthy and function properly. Mentally we need a certain amount of time in the day not filled with crying. We need to reset. While the way we fulfill this need might change, we don’t stop needing. Unwinding after a rough day pre-baby may have been a couple glasses of wine and a long bath. Unwinding after a rough day with baby might be sitting in the dark like a troll eating ice cream and finally watching your Bravo show uninterrupted. But that’s okay! Becoming a mom is naturally going to change you. It’s meant to. It’s a beautiful journey and can make you feel a sense of whole you never thought you could feel. Caring for this tiny being is incredible. BUT it doesn’t, and shouldn’t, mean you stop caring for you. One of the best things I was told in this new mom journey was that they only way you need to judge your success for the day is by asking yourself: Is your baby alive? Are you alive? If the answer is yes, then you did it. You succeeded that day. Some days maybe your house is covered in little fur ball tumbleweeds from your insane dog, dishes are dirty in the sink, you didn’t get to workout, and all you ate between 5am and 5pm is a half a bagel and a Sargento balanced break. Other days maybe you woke up before the baby and made coffee, got yourselves both out of the house for a workout class, went shopping, did a load of laundry, prepped dinner, AND got her to nap twice in the same day… But no matter which of those days you had, if your little one is alive at the end of it then you succeeded. So mamas, STOP putting too much pressure on yourselves. You’re allowed to not have it all together all the time. You’re allowed to let things get to you. You’re allowed to cry. You’re allowed to feel stressed. But what you’re not allowed to do is ignore those things. It’s too easy to suppress the whirlwind of emotions that come with motherhood. You CANNOT POUR FROM AN EMPTY CUP. If you do not take care of you, eventually you will have nothing left to give. Be proactive. If making sure that you get self-care time means scheduling it – either with your significant other, a family member, a babysitter, etc – then do it. Moms are amazing people, if I do say so myself. But we are not superheroes. We are just people. We have needs. Remember that your needs matter just as much as the needs of your spouse, your kids, your pets, your family, your friends, your co-workers, and whoever else you have been putting before yourself. So go take 30 minutes to workout ALONE, take a long hot bath, have that glass of wine, watch your favorite show uninterrupted, go out with a friend. Hit the reset button. You will be a happier person and a better mom because of it. In recent years the #fitpregnancy movement has truly exploded. We see so many women today conquering this whole pregnancy thing while still being complete fitspiration. From the women still completing Crossfit Opens to the women in belly popping handstands to the ones running marathons at 30 weeks. It has become more and more apparent that we are complete badasses 😉 … and that the body can do so much more than we give it credit for! This movement has sparked many a conversation, a critic, a hopeful. It has opened the door for more discussion about how it isn’t just totally awesome for these women to still be managing their fitness while pregnant and about how it’s also ridiculously important. For such a long time working out while pregnant was monitored in a way that limited women or made them feel as though they were doing something wrong by maintaining their own bodies during the time when the focus should be on the new little body forming inside. Too many women stopped exercise routines or became so overly cautious that there was more damage being done than there was good. Thankfully, today it is the norm for doctors to discuss the importance of exercise with pregnant women. It is encouraged that women who are pregnant get an average of 30 mins of exercise per day, 5 days a week. However, there is still so much speculation on what this should look like. Being 22 weeks into my first pregnancy I am finally beginning to truly process what it means to be pregnant and “fit”. Pregnancy has been even more of a roller coaster than I ever expected. No matter how people explain things to you or how much you know about pregnancy and the changes your body will go through, you will never fully understand what it all means until you experience it for yourself. I always keep high expectations of myself and I knew from the beginning that if there was one thing I wanted to conquer during pregnancy it was the ability to keep a good fitness routine. It became quickly apparent that this was going to mean something completely different to me than it has in the past and for most of the first half of pregnancy I struggled with finding a balance for myself… How do I live up to these expectations that I set for myself when I barely understand what is happening with my body and why I feel the way I do?! When I first found out I was pregnant there were so many questions and emotions to be sought through. Anyone that knows me well knows that I will research until the cows come home. So that’s exactly what I did. I wanted ALL THE INFORMATION. I made comparison charts from every site I trusted to put together a comprehensive list of all the vitamins and minerals I needed to be getting and in what quantities; using this to pick my prenatal vitamin. I looked at article after article about what I needed to start or stop doing for my body. Many of the changes were easy to make – even giving up my beloved wine ;P – but the most difficult was my exercise routine. I read many articles about movements you should avoid or how hard to work out and how to know when to stop but so many of these articles and these sites had conflicting information. Images and videos of women jumping rope when they look like they are about to pop to articles warning against any bouncing movement. 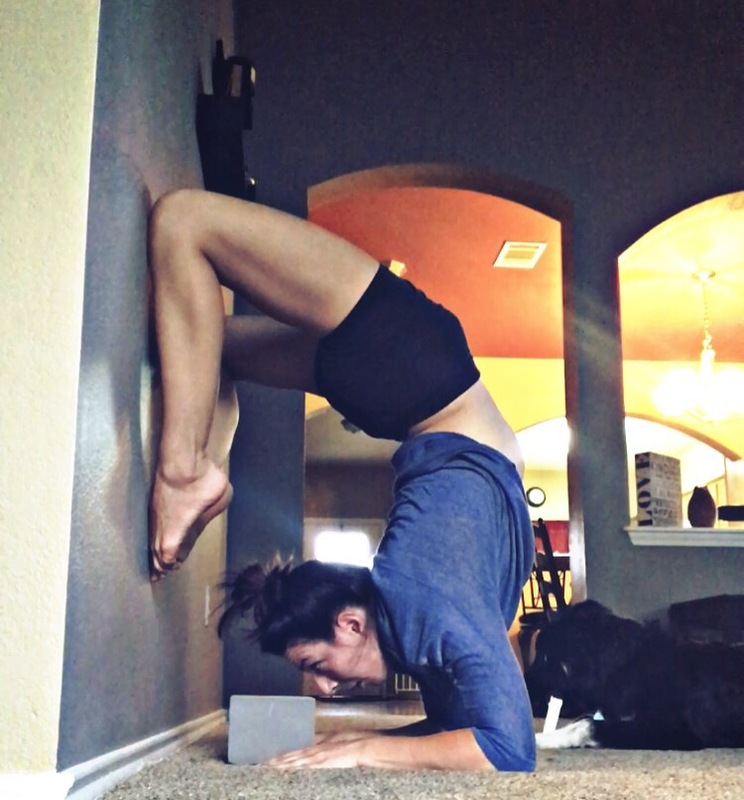 People in handstands to women saying that your balance won’t be good enough to do any inversions and you should probably switch to only prenatal yoga immediately. I was overwhelmed and discouraged by how at odds people still seem to be about what kind of exercise is appropriate. So I read and I read and I read. I talked with the yogis at my studio, with experienced fit mamas, and with medical professionals. I knew in my heart that I could navigate this path with the years of knowledge and experience I have gained in the fitness world myself but I was a million times more terrified than I thought I would be. Over the last 22 weeks, I have gone from being unsure and learning to being completely frustrated with the process to adapting to limitations and being satisfied and proud of everything my body can and is doing. In the beginning it was about making sure to stop myself if I got too short of breath, being careful of twists in yoga, and honestly just being on edge because nothing FELT wrong but I was avoiding what I was told was wrong. What is so difficult about pregnancy is that it isn’t a broken arm, a torn shoulder, a battered knee. Pregnancy doesn’t immediately put a strict physical limitation on you but you are still tasked with the job of protecting anything that could POSSIBLY harm the little one, who is just starting its own journey. You are protecting this thing you can’t yet see or feel. You aren’t modifying a movement because you physically CAN’T do it. You are modifying a movement because your body needs something different right now… Even though you don’t feel ANY different yet. This is the first mental game. All of a sudden out of nowhere nausea and exhaustion hit. These were the first physical barriers I felt to keeping up my workout routine. THIS is where I became truly frustrated. Let me remind you, my expectations for myself were set high. So when I came home from work feeling too exhausted to have any motivation to workout I got mad. I was mad at myself and at the process. I would take a 5 minute power nap and then force myself to at least do 10 minutes on our airdyne or struggle through SOMETHING. On days the nausea was bad yoga was NOT my friend and there were a few weeks that I only got in a workout 4x… That was not the goal I set for myself. That was not where I planned to be. My mental strength was falling, fast. All of a sudden at about 19 weeks and 4 days I felt it. The first kick. Or roll or whatever it was… Definitely a roll… The first signal from my little person. THAT is when everything changed. Over the last couple weeks I have been able to find this new light, this new outlook on what it actually means to maintain fitness through pregnancy. Its not about comparing yourself to before. Its not about being able to do everything that you used to be able to do… Cause trust me you can’t and won’t be able to… And it’s OKAY. Why? Because H O L Y S *** there is something awesome happening to your body! Your body is literally MAKING ANOTHER HUMAN BEING! #Fitpregnancy isn’t about being extreme. It’s not living up to an ideal. It’s about being the healthiest version of yourself that you can be right now. It’s about giving your body the strength and tools it needs for the birthing process. It’s about making sure that your body stays functioning well because ultimately that will lend to your little nugget developing the best it can. It’s about loving how strong and amazing and inspiring you are just being a woman – even if one day you can barely stay in a downward dog without needing a break. It’s also about embracing the days you feel like you can go full speed ahead. It’s about finding your own balance. It’s about ignoring the critics and the people that want to judge you and tell you that you shouldn’t lift weight or be upside down… Or tell you that you “make them nervous” because they have never in their life attempted any of the exercises you are doing, not realizing how much of a modification these things are for your normal routine… It’s about knowing your own body well enough that every single week, every single day, you can adjust to whatever you can do THAT DAY… And its about loving yourself for doing it. Today my forward folds require a little bit wider stance than normal, I can’t go down to my belly anymore, my weights are a lot wider, and I hit the lowest power output in a spin class than I ever have before. In the last week I have worked out 6 days in a row. I have done a crossfit hero wod, I feel AMAZING when I am upside down in a headstand, my crow pose is sometimes more balanced than its ever been, I did burpees in the middle of a yoga strength class, I sweated, and I have felt AMAZING every single day. I no longer care if I can’t keep up with someone else in a workout class. I no longer think twice about if I should try that pose or just modify. I do exactly what feels right for me in every moment… And at the end of every workout session I can feel a small little person doing flips of excitement (and I like to think approval heehee). And I smile. Every. Single. Day. Anything that tells me it is going to strengthen my nails I usually roll my eyes at. For the better part of my life my nails have rebelled against me; no matter what I tried. The food, the “strengthening nail polish”, the oils, none of it ever made my nails stop peeling. It was especially bad anytime I painted my nails and sometimes, back me up here ladies; we just want to look good! For some time my husband and I had been discussing trying collagen. However, to be honest I just didn’t know enough about it to take the plunge. How would it fit in my diet? Why did I need it? Would it really make a difference in anything? After doing some research on how and why people use collagen as a part of their diet, we decided to order some from our favorite online marketplace – Thrive Market. We order the unflavored Thrive Market brand of grass-fed collagen. A few days later I was putting the very first scoop in my bulletproof coffee. Now, taste wise, I would not recommend unflavored collagen on its own – unless you’re the type of person that likes cloudy tasteless drink HA – but in my coffee it was pretty darn good. It gave it a creamy and frothy nature, as if I was sipping on a nice latte but without the milk! I used it that first weekend as my pre-workout Saturday and Sunday morning. I loved how it made me feel during my workout and decided to keep exploring the benefits I might experience for this beautiful fine powder. So let’s back track for a second. What is collagen? Collagen is a protein. It is actual the most found protein in our bodies; feeding our bones, muscles, tendons, skin, and digestive track. However, collagen production slows as we age. This is why products on the market today are advertising their collagen base. Women especially are pushed expensive face and body creams, makeup product, and pills that contain collagen. The less collagen our body produces the less support we have for our bones, skin, hair, nails, etc. So beauty products containing collagen are marketed as helping to reduce wrinkles, give us shiny hair, and strengthen our nails. Now, should we make sure to have a higher collagen intake especially as we age? Yes. Does it need to come from overpriced and chemical filled creams? Absolutely not! This is where powder collagen comes in. Collagen is found in animal based foods; primarily in bone broths. Unfortunately, most people don’t consume enough bone broth to fulfill a good collagen intake. Powder collagen is a great solution to this because of its versatility. It can be added to coffee, juice, water, smoothies… Really anything that you can dissolve a powder into you can add collagen too. Unflavored would be my pick if you want to really create the ability to be versatile with your collagen consumption because regardless what you add this to it will retain the flavors of the liquid you are putting it in. Since I typically only consume bulletproof coffee on the weekends – mainly because I leave for work at 6am and value you my sleep – I had to find another way to get a consist intake of collagen. It started out slow, probably having it about 3x the first two weeks. I would add it in coffee when I did have bulletproof and when I did not I would throw it in a shaker bottle with the raw meal powder I have each morning for breakfast. Again, the lack of flavor meant there was no change to the taste of my usual shake in the morning. Recently, I have been making smoothies in the morning and throwing a scoop of collagen in those. Really there are so many ways you can make consuming this powder a habit! I have worked myself up to 5x a week that I incorporate this powder into my diet. Now let’s talk about the results: Why do I keep taking this powder? What difference have I seen? I am also very much prone to breakouts, especially during that time of the month. My monthly breakout was so much less substantial and cleared up faster than ever before. My skin looks and feels smoother. Luckily I am not at the point of worrying much about wrinkles but my skin feels so nice that I am confident if my intake of collagen continues I will put off the visibility of wrinkles for much than I would have otherwise. Lastly, as I also briefly mentioned, I have loved how it makes me feel energy wise. I have longer sustained energy, my metabolism doesn’t miss a beat, and when I use this as part of my pre-workout routine I can feel the difference both during and after. Collagen helps promote lean muscle mass; working both during your exercise and following it. Gycine helps convert glucose into energy that feeds muscles – helping during your workout. Arginine increases the body’s ability to make protein out of other amino acids – helping with muscle repair as well as long term recovery and growth. Now, there are many more benefits to collagen but I feel most confident in sharing with you what I myself have experienced during this trial with collagen. I am more than happy with my results and plan to continue supplementing with collagen for a long time to come. Have you had any experience with collagen? 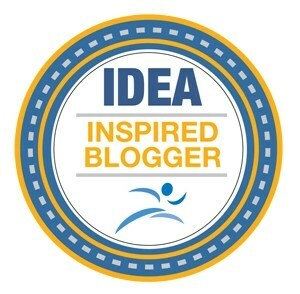 Are you intrigued by the idea but unsure where to start? If you’re follower of my site, you know that I have always been all about all things Crossfit. I have so many posts that rave about how Crossfit completely changed my life… And well it did… But sometimes life throws things at you that make you change again; change from the person you thought you were. CrossFit has been a part of my identity for years now. So much of how people knew me revolved around how much I loved crossfit; as a sport and a community. In fact, when I moved from New Jersey to Texas I had my new Crossfit community decided on before I had picked an apartment! It was the centerfold of what kept me calm, happy, challenged, and healthy. It changed my self-image, confidence, motivation… It changed everything. It turned me from this person I was so unhappy with to someone excited about life and tackling every day. But what happens when this thing that you loved so much, that made you so happy, is now the source of pain and frustration – mentally and physically – what do you do? How do you move forward? I spend my days at work having patient after patient tell me about all the things that have gone wrong in their lives. I sit in this state jail listening to these men take a victim role and talk to me about how everything has happened TO them. I counsel them, I conduct group therapy, and I try to teach these grown men how to develop the skills to cope with, accept, and move forward from these burdens they carry. And all of a sudden, I found myself struggling to find a way to go through that same process. About a year and a half ago, I started experiencing a lot of strange pains in my body – things I had never felt before. They came and went at first, then got gradually worse and more frequent. I started working with doctors and eventually had a laparoscopic surgery to diagnose Endometriosis. This was almost exactly a year ago. June 3rd 2016. I was officially diagnosed and told that 5 various areas of my body were affected. However, I was told that the lesions were handled and that my pain should subside. Well fast forward a year and I am in more pain than ever before. The year following surgery has been a roller coaster and I am nowhere near the end. As many of my posts over the last year have discussed, my pain returned soon after. My doctor swore it was not the Endometriosis back so soon. They couldn’t find any cysts or other explanations. Specialist after specialist turned me away with clear tests and blood work every time. 6 months ago I began working with a Functional Medicine specialist. We were able to clear up some issues with my gallbladder and did some of the most expensive, as well as mentally and emotionally exhausting, tests and planning I have done in my life. We found out my hormones were a mess. I finally gave in and told myself, maybe it has been these hormones the whole time. I told myself that. I told my family that. I told my fiancé that.… But I really didn’t accept that. I couldn’t. I had a mental block. About two months ago, I started noticing how few things I could do without pain now. My pain went from bad to worse and workouts were absolutely unbearable. I cried in the middle of a workout on more than one occasion before I finally took a step back. Crossfit went from being my form of stress relief and my happy place to the thing that was increasing my pain, making me cry, and adding a level of frustration with my physical self that was worse than anything I have ever experienced. Here I was in full swing of wedding planning trying be excited about getting ready for the most beautiful day of my life and I cried the day my wedding gown came in, not from excitement, but because I didn’t even want to go try it on. The pain was too much. My stomach was constantly distended. I could barely stand up straight most days because the pain in my abdomen was so intense. How was I supposed to put on this gown and feel beautiful?! That’s when I decided that I needed a change. When I walked into my first yoga class in a LONG time, I knew I found it. I found a place I was meant to be. It was slow paced, relaxed, and strongly based around meditation. But it was challenging and it was filled with things that challenged my skill level, challenged my fitness. It was perfect. It was the first time in 6 months that I felt calm. It was the first night in months that I did not cry. I went a few weeks of trying to still fit in my normal Crossfit routine. I was scaling some things back but still pushing hard; still in denial of physical limits. I didn’t want to give in to pain. I didn’t want to be weak. I was trying to use yoga to counter my heavy lifting and intense workouts. It wasn’t working. About mid-April I stopped going to Crossfit entirely. I went about a month that way. I did YouTube yoga at home and went to this new studio. I was running and maybe trying some slow paced light kettlebell workouts in my garage. I was emotionally struggling through losing something that was such a big part of my identity. I struggled with giving up something I was still so sure was the only thing that made me tough, made me great, made me the person that everyone expected me to be… That was it. I had to be the person everyone knew me as. I couldn’t change that image. I couldn’t disappoint people. Eventually, a few weeks ago, it got to a point that I could not even run. I couldn’t do a mile without searing pain in my abdomen and an uncomfortable feeling that lingered for almost a full day afterwards. I went to the 6th new doctor I’ve seen in less than a year. As it stands we are exploring the possibility of a hernia or abdominal wall tear/strain. I still have no definitive answer … and a lot of pain… This journey still has a long way to go but what I am very proud of and what I want to share with everyone is that sometimes we have to reinvent ourselves, even when the self we were before was not a bad version of us. Most often people think changes in fitness and exercise routines or diet styles are something that people who have a full swing routine don’t need to think about. Why would someone that participates in such a challenging and intense exercise regime change? Why would you give up something that has turned you from an unhealthy post –grad to a strong, fit, healthy role model? Sometimes the things that make us who we are have to change. Sometimes we are forced to redefine ourselves. The key is doing that without losing yourself. When life throws something at you that makes you take a step back and re-evaluate your lifestyle it is not a cause to give up. It is not a cause to abandon your beliefs or your mentality. It is a challenge, a test of resilience. How would you stand up if the cornerstone of your being was taken away from you? When the way you define yourself is forced to change? Over the last 3 weeks or so I have begun to embrace a new lifestyle. I have accepted that while I explore what is going on with my body, I need to find another way to keep myself stimulated. I realized that I love Crossfit because I love being challenged. I love having difficult physical feats that I can master. It validates me. Considering how limited I am physically, I turned back to yoga. I have done two crossfit workouts in the last month and they were EXTREMELY scaled. However, I have done yoga more days than not. And I am IN LOVE. I am smiling daily. I am happy. I am relaxed. I am embracing the journey and allowing myself to find a calm in this storm… And I am challenged. I am pushed HARD. I am finding my body doing things I could never imagine doing before. Never be afraid to redefine yourself. You might be surprised with what you find. I started my journey into the world of health and fitness four years ago this month. Four years ago this month is when I first walked into a Saturday CrossFit class and had my life turned upside down *Will Smith voice* 😛 … But really… I finally found something that triggered a change in me. I finally learned how to love my body and how to treat it like I do. I started to eat better. I got stronger and leaner. I FELT healthy. I felt GOOD every day… Little did I know that something unseen was brewing inside me. There was a piece of my health that I didn’t know was not being taken care of, that I didn’t know was not well. I am sure you can tell by the title what that lovely piece was so let’s really start this discussion by defining endometriosis. It’s a term that I heard very few times before my own diagnosis. It was something that I didn’t fully understand even up to and after my surgery. Endometriosis is a chronic illness in females. 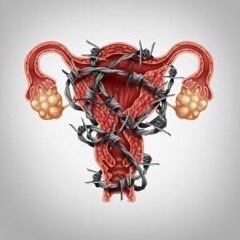 It occurs when tissue that normally lines the inside of the uterus starts growing on the outside of the uterus; growing on the outside of any or all organs within the abdominal cavity. Because this tissue is similar to that of the tissue that lines the uterus it follows patterns and signals from the female hormones. Meaning that it reacts the way it would if inside the uterus, thickening and shedding in correlation to a women’s monthly cycle. However, with endometriosis, the tissue has nowhere to go, it cannot shed, and therefore creates scar tissue and adhesions on these organs. Endometriosis is an unseen and for some silent (until its very much not) kind of disease. So, back to my journey, throughout this time making my body so healthy I was unknowingly developing what I would later find out to be 5 different spots of growth and adhesions caused by endometriosis. 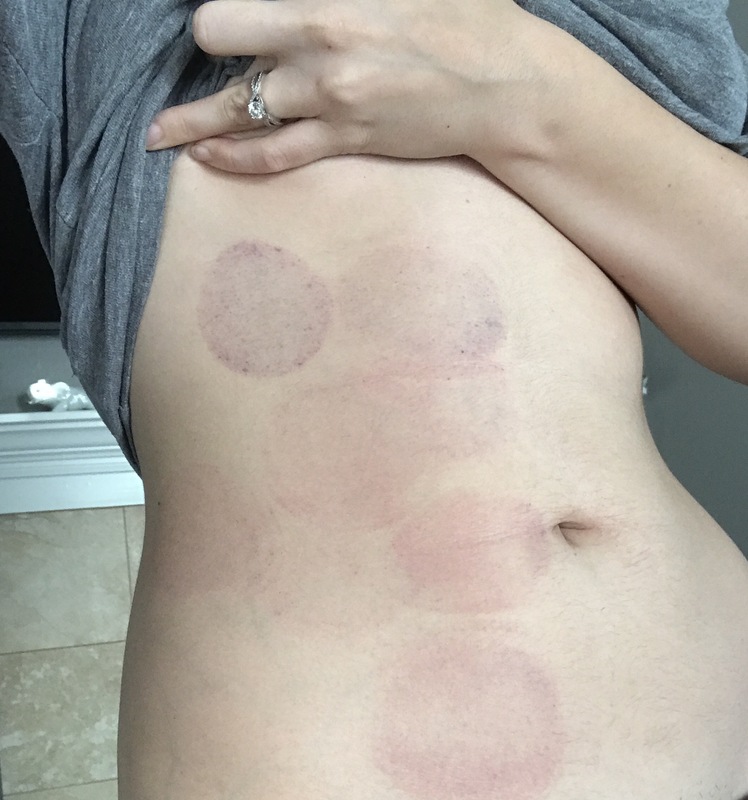 Because this disease not easily diagnosed, often misdiagnosed, and rarely discussed openly I went – what my doctor said was probably years – having these growths develop without knowing. Now they still don’t know the exact causes of endometriosis so could I have stopped this? I don’t know. Would it not have been as bad if I found it earlier? I don’t know. My point in stating that this was a silent development in what I otherwise thought to be a healthy body is simply to show that there is not shame in developing an illness. That just because you lead a healthy lifestyle does not mean you cannot also have a chronic illness. You are not guilty. You are not a failure… But you can read more about my feelings on that in my first Endo post back in June. Now where was I… Oh yeah… These growths where developing with me knowing. That is until everything came to a head and what used to be a “weird feeling in my right side of my abdomen sometimes” turned into an inability to function for days at a time. It turned into this incredible, incomparable pain in my abdomen. It turned into lying in bed crying. It turned into nausea, dizziness, and agonizing pain during various activities. MONTHS of repeat ultrasounds, CT scans, birth control, pelvic exams, and blood tests with no results and no subsiding in pain later and finally in June of last year my doctor decided to operate. You see the only way to really truly diagnose endometriosis is through Laparoscopic surgery. So we did the surgery and she told me she was able to laser it all off. She made it seem as though that was it. I was good now, I would be pain free. She gave me a high dose birth control and sent me on my way. I think I lasted a couple months without having pain again. By around the end of August I was back in her office. I told her there was pain and I didn’t know why. She said there was no way it was the endometriosis coming back so quickly so I thought it had to be something else. What else could be going wrong? She told me again it might be cysts – even though she didn’t find any – and again, I let it be. You see I was healthy. I eat paleo. I do crossfit. I coach crossfit. I am active. We use all natural products in our home. There was nothing that I could think that could be adversely affecting me. How could I get sick again?! It had to be nothing. It had to just be residual from the surgery. Unfortunately everything got worse around October and November. I was so sick some days I would wake up in the middle of the night with my stomach swollen to where I looked pregnant and crying in so much agony. I would wake up my fiancé at 3 or 4 in the morning just for comfort because it felt like some sort of attack. In fact, many times this kind of severe endometriosis pain gets mistaken for appendicitis… or even worse, women with endometriosis don’t know they have appendicitis because of having dealt with the same pain for so long. I was nauseous and throwing up every day. I had to give up coaching crossfit because I couldn’t commit to being well enough every day to be physically active and able to do so. My health was so unpredictable. I was frustrated and angry. I went to doctor after doctor after doctor looking for answers, looking for a solution. If it wasn’t the endometriosis what else could it be?! What else could be wrong with me?! I was told there was nothing wrong with me. My body is functioning great! Every test came back negative. Every exam from a specialist in every area possible showed nothing. While this would usually be good news, I knew I was in pain and I knew there had to be an answer. Even a desperate and scary ER visit resulted in a prescription for pain meds and nothing more. Finally I found a functional medicine doctor who ignited change in my search. So what does endometriosis feel like? I think this is the biggest, and most difficult to explain, factor when it comes to awareness. Awareness means spreading information – information of what the disease is, that there is no cure for it, that it is more common than you think (1 in 10 women), that it is NOT talked about enough, that there really is not enough scientific data for doctors to understand it enough, and that the pain is crippling. I am writing this post because awareness means knowing the torment we feel, including the psychological torment. It means letting other know they aren’t alone in this either. For me the worst part has been how exhausting this has been mentally, how much it has changed my entire life – without my permission. My new hormone treatment has left me exhausted and emotional. I cry more days than not. Sometimes I don’t know why and sometimes I can’t make it stop. Some days it almost feels like a wasted life. Some days I struggle so hard just to make it through the day. Some days the only thing in the world I want is just to not have to; to not have to leave my bed that day. Those days I am so blinded by the physical pain that I find myself heading home after work not even knowing what just happened in my day. But even more than all of that is the feeling of failure… Failure to continue this life of fitness I worked so hard to build. Too many days I feel like a disgrace to the person I want to be. I am writing this post because there is not enough of this out there for women like myself… Trust me I looked… Over the last couple months I have spent countless hours doing research, reading other women’s stories and figuring out everything I could do to make my body as equipped to deal with this chronic illness as possible. The one thing I have not been able to find much of is support for women who are struggling with losing their athletic identity. Having to go through the recovery from surgery was difficult for me because I was limited at crossfit. I was forced to back off, not do certain things, and lift lighter or not workout at all. It was frustrating because crossfit has been such a part of my identity for years that I felt lost not being able to participate. I had no idea that this would be made worse. Over the past 4 months I am learning the things my body can and cannot tolerate. This month there were two full weeks that I was unable to participate in crossfit workouts or lift weights – at all. It just wasn’t an option. My body was in too much pain and strain of any kind only made that infinitely worse. Many times even when I do go to crossfit my body is so unpredictable that I have had days of crying myself through a workout because I felt so uncomfortable in my own body or days that one movement unknowing exacerbated an inflamed area and prolonged my abdominal pain for an extra few days that month. Changing my routine has been the most difficult part for me; acceptance of having to change even more so. Chiropractic, herbal supplements, acupuncture, yoga – lots of yoga, eating a mostly paleo, super food dense, and anti-inflammatory diet, and participating in crossfit workouts when I feel physically comfortable and able … Those are how I am getting through this time. That is what my routine looks like now. Trying to maintain an active lifestyle 5-6 days a week by participating in whatever activity my body is telling me it needs or wants – or can handle – that day. The path through life is ever winding. The only constant is change. Having a chronic illness is a difficult thing to adapt to. It’s not a surgery or a broken bone where you heal after a given time and resume normal activity. It is a forever change. It is a change that is itself always changing. Most often, as is the case with endometriosis, it means a re-evaluation of your daily activities. It means a big lifestyle change. It means finding acceptance in yourself, in your illness, and in the changes you need to make. I want women like me, struggling with having fitness routines of heaving lifting and hard workouts, to know that you are not alone in your mental battle to stay on your journey. I also want women like me to know that you are not weak and you are not a failure for changing your path. You are not less because you can’t lift heavy every day. You are not less because you can’t keep up with people in a WOD one day. You are not less if you cannot participate in intense workouts for a week. You are not less if you change your routine. You are not less if you shy away from what you used to do in order to open up space for things you can do… In fact, I think the acceptance to listen to your body and do these things makes you stronger than those who do not. Set goals for yourself, realistic goals. Plan out your exercise routine for days or weeks at a time –avoid allowing yourself to fall into the slump of doing nothing for too long. BUT also find acceptance in the days you cannot stick to that plan. Know there is peace in having to run or go to yoga on the day you had planned to lift because that is what your body needs. Remind yourself that there is no shame or guilt in changing your fitness routine; that there is no failure in change but rather success. In fact, I think the acceptance to listen to your body and do these things makes you stronger than those who do not… For the most successful of people are those able to adapt to changes; in themselves, in their lives, and in their environments. And always remember – You are strong. Even on the days where you don’t feel like you are. You are powerful. Even when you can’t hit that same power output in the gym. You are beautiful. Even through the weeks streaked with tears. You are everything you want to be. Find what works for you, what works for your body. A change in your health and fitness journey does not have to mean an end. Women are constantly under pressure to take care of themselves a certain way. So when you are expected to look good, or at least hygienic, how could you possibly deter from your normal beauty plan? How could you STOP using conventional beauty products? It just doesn’t make sense. Well I am here to break all of that! I can tell you that for over a month now I have not used a store bought facial cleaner or store bought hair care products. 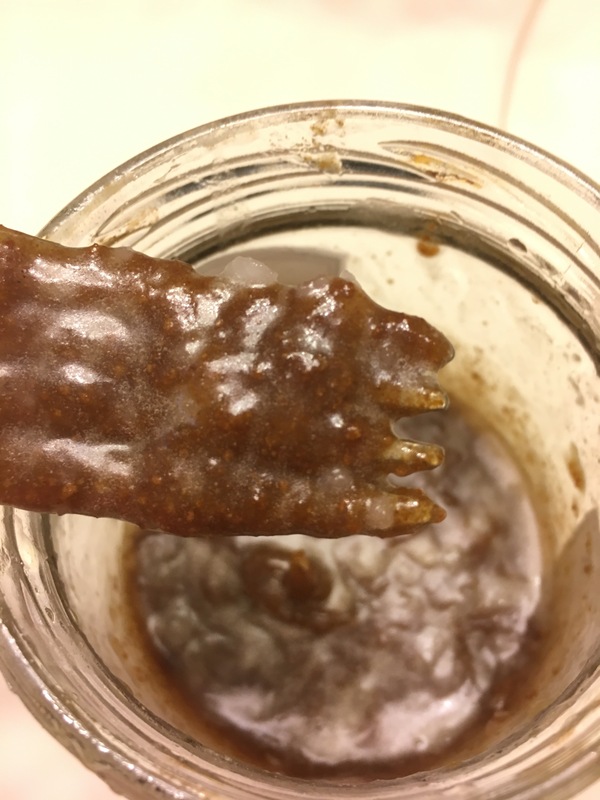 I have cared for my face and my skin using variations of my previously posted facial scrubs recipe and truly I love it… And it smells and feels amazing! Now I also know that it seems a little more accepted to make homemade facial scrubs. Heck I remember when I was a kid and my cousins and I used to think we could do homemade spa days and try out crazy recipes like these on each other. Now we were just having fun but my point being that it was a normal thing to do and we thought we were cool as heck doing it. But transitioning from conventional shampoos and conditioners… That is a WHOLE other animal. I will admit that I attempted this once before. It was probably about a year and a half ago. I decided I had read about “no poo” and I wanted to give it a go. The problem for me is that I didn’t do my research. I was impulsive. I also didn’t have the same motivation back then. I thought it was intriguing and wanted to give it a go but didn’t have a reason to stick with it. So when things got rough – and greasy – I quickly gave up. If you don’t know what “no poo” is, it is a movement where you cease using shampoo but believers in no poo typically go for shampoo of any kind. Most of them simply use some baking powder and an ACV rinse once a week or so. While many of them even stop any kind of hair rinse and simply wash with water. My hair on the other hand has always been thin and sensitive, so this plan was not the one for me and my attempt ended pretty abruptly. That brings to why I am writing this post today. Well, as you could guess, I gave it another go. This time instead of just jumping full on into “no poo” again (I knew better this time), I decided to do some research and really figure out my best game plan. This time my motivation came from my health issues. I have been working hard to naturalize all areas of my life. Considering my exercise regime and eating habits are pretty under control, I looked to the other areas – my household and personal products. What do I use to clean my home every day? To clean myself? What could I change? I decided that the chemicals being absorbed into my body through some of my personal hygiene products were not worth it. I decided a change needed to happen and I wanted to figure out a way to keep myself committed to this. I want to shout out one of the blogs I found that really gave me that final spark to go for it again. So thanks Kayleigh , you rock! If you decide to go for this all natural style, you WILL have a detox period. It won’t be fun or pretty necessarily but it will be a finite amount of time. You see, conventional shampoos strip your hair of its natural oils. Therefore, when you stop applying the chemicals to your hair to break the oils down, your hair will have its own oils again… All the oils… It won’t know how to regulate them or deal with them because it hasn’t had to. So it will initially overproduce oils. You need to allow your hair the time to learn what its own oils are like and how to process them properly. BUT that also doesn’t mean that you have to just walk around look like a grease ball. There are natural ways to help your hair (and your sanity) through this period. For me this method was rahssoul clay. Rahssoul clay is an all natural powder. It is absorbent and will help draw out and soften some of those natural oils. It can be excessively drying however, so it is most likely not a long term solution but I used it for the first month and it was great. Typically for one wash I would use 1 tbsp of rahssoul clay. In a plastic bowl and with a plastic spoon (you CANNOT use metal … because science things they say) mix either water or apple cider vinegar into the 1 tbsp of clay until you have soupy mixture. Now, some people would create a thicker mixture and let it sit in their hair. However, I found that for me it worked better if I was able to simply rinse it through my hair. I also personally used ACV due to needing the extra pH. ACV will help your hair from drying out too much from the clay but if you have super greasy roots, go with a water mixture. It may take a few tries to get it perfect for YOUR hair. Don’t get frustrated. As I said, I used the clay mixture for just over a month. Once I started to notice that I could go longer without a wash and without having to throw my hair up because of the grease, I decide to move to my next mixture. The clay is not meant to be forever but it could also be a good once in a while cleanse for your hair as needed. However, there is a recipe that could become your go to. It may take some playing around to find a perfect mixture for you but after I tried this combo I was immediately in shock at how well my hair responded! Soapnut powder and Shikakai powder. Again, there were so many variations out there but what I decided is to do 1 tbsp of each (soapnut and shikakai) mixed with water until it gets a thicker consistency; something a little more than soup this time. Section of your hair and rub mixture into your scalp. I will warn that when I first put it in my hair it felt ROUGH and thick. I truthfully did not think it was gonna go well. My hair felt tough when I rinsed it out. But then I went to brush it..
My brush ran through my hair like nothing! I let my hair air dry and when it was almost dry I accidentally caught my reflection and had to do a double take! I touched my hair to feel a soft, light texture. My hair looked full but not heavy. It was beautiful. I can truly say that I almost never leave my hair down at night because it also looks horrid. I also never take pictures at night (because of my hair) and I just had the strongest urge to take ALL THE PICTURES. I will say, I am still in the beginning stages of all natural shampoo. However, the results I have seen thus far only motivate to keep this as a lifestyle change rather than just a challenge to myself. If you want some proof I did take some non-snapchat filter pictures to show how well my hair came out… Keep in mind, this is just about a month and a half without any conventional shampoo or conditioner. My hair air dry-ed and was not treated with anything following…. I have always loved homemade scrubs; body, face, hands, feet, you name it! Though I will admit that I have not been as on top of making my own scrubs as I’d like to be. Well it’s time for that to change! As I prepare for my wedding (10 month countdown! 😬😁😳), I have done a lot of research and made lists and goals to help me get more serious about my beauty regime. You see beauty it’s not just about the eye liner or coverup you use. It’s about health. It’s about having healthy skin, healthy hair, healthy nails, healthy body, healthy mind. It’s about feeling so good that you are not even concerned about that coverup! Beauty is confidence and to me confidence comes with health. So I have made a decision to use only the best and most pure products on my skin from here on out. If you don’t know this already, the things we put ON our bodies is just as important and the things we put IN our bodies… I have touched on this before when I did a review on an amazing Au Naturale makeup company (you should check it out 😉)… So I know that leading up to my big day, and just for my life in general, the benefits of making homemade scrubs outweighs the ease of purchasing chemical ridden cleansers in store. With that sad I wanted to share with you the facial scrub I made today and smells and feels like the best thing I’ve ever put on my face! This scrub is good for both body and face. If you are looking to make a large quantity and use it for your body, try out adding some citrus essential oils in place of the lavender! I don’t recommend citrus for facial scrubs due to the intensity and risk of burning if it gets in your eyes. But the health benefits of orange and lemon on skin is wonderful if using for a body scrub! Always keep your scrubs in a sealed glass container. And remember that a small amount goes a long way! 3 months. It has been 3 months since I last posted. I have had many a topic up my sleeve, started writing, never finished. There are many reasons for why my time has just been cut so short and left the blog lacking. It could be the fact that I started coaching at CrossFit Cedar Park and immediately took on a full load of classes. (woohoo! – There will be more on that later) Juggling that on top of another full time job, working almost 70 hours a week, moving into OUR FIRST HOME the end of March, and just trying to live life has left me kind of exhausted. I mean I will admit they were pretty awesome reasons to be exhausted, but exhausted none the less. Unfortunately, even more than these fun things happening there was the building issues that I was struggling with amidst all of this that left me down for the count. That made every minute I didn’t have a job or a workout or a household task to be doing a minute I just wanted to sit or lay or rest. For some time now I experienced on and off abdominal pain. For a while it was simply just a day or a few hours and I would toss it up to a strain or something related to the intense and consistent exercise routine I had. However, over about the last year, these pains became more frequent. So the first thing I thought was digestion… I took the time and effort to change and restrict and test my diet; through my own experimentation, cleanses, and then completing a challenge back in November with my gym. I became so strict with my nutrition and saw amazing changes in my body, in my skin, in my strength, in my energy. I tried everything in the book to see if perhaps it was something I was eating that was causing an undesirable reaction. Through all of these trials and changes one thing remained consistent… my pain. Finally I broke down and went to the doctor in January. It was time to find answers. Well a few tests and an ultrasound later and nothing. There was nothing wrong with me? So maybe the pain WAS in fact a strained muscle? And maybe I just never let it heal properly or wasn’t being as careful as I thought. So I let it be with the advice of coming back in if it got worse… Well, guess what happened within a few months? Yup. You guessed it… It got worse. By March it was awful. I had days, or if I was lucky a week, where I would be pain free. But most days were uncomfortable. I returned to the doctor for more tests and yet another ultrasounds. This time they found a cyst on my ovary but the doctor informed me that it appeared it had already burst, to which she attributed pain, and said it was clearing itself up. She seemed unconcerned. I was advise to take a specific prescription and told it shouldn’t give me too much of a problem anymore. That was calming… But when the pain went away for only a week or two and then proceeded to do nothing but increase, the calm was hard to keep. By the time my parents came to visit me at the end of April, I was struggling to put on a brave face. I was in pain and uncomfortable more often than not. Finally, I got in for a 3rd appointment in the 2nd week of May. At this point, we were left with one option. My doctor had a strong feeling it could be endometriosis and her only recommendation was to go in for a diagnostic laparoscopy; to head right on inside and actually see what was going on. I scheduled it and had a few weeks to wait. But I was ready… right? I had to ready. Ready to be out of pain. Well over the few weeks I waited for this procedure, my emotions got the best of me. I was appalled, frustrated, shamed. Years of CrossFit. Years of changing my entire lifestyle. Years of focusing in on my nutrition and striving to have the best health possible. How does this happen? Illness and disease is supposed to happen to those who don’t devote so much of their life to being healthy and living healthy. From chemical free makeup and homemade shampoo to homemade household cleaners to organic and all natural supplements to a paleo (and sometimes paleo-ish) diet… I did it all. Did that all count for nothing? My world was being crushed and I was having a really tough time wrapping my head around everything that came with this possible diagnosis. To make it even worse, the nurse who did my pre-screening for the hospital acted shocked to everything I told her… I had no previous existing conditions. I take no medications. I have no history of health problems. I have never had any other kind of surgery or medical procedure… With every answer I gave her voice became more and more shocked. Am I the only one that thinks that is unbelievable? That no one at the age of 26 can have a perfectly fine bill of health; up until this incident that is. That a nurse is shocked that a young person is living a healthy lifestyle? It blew my mind… And just made me feel even worse about the whole situation. Really, how did this happen? Even worse, I didn’t have a definite answer yet! I”ll save you all the suspense… Turns out, yep, it was endometriosis. My doctor found it in 5 spots. Luckily, it was mild and it was able to be laser-ed off. So now there I was, done with my very first operation. Happy to have results but a little scared to see what would come. Today marks one week post-op. For someone who works as a crossfit trainer, has an active full time job, and workouts typically 5-7 days a week herself … Let me tell you, laying around and resting is TOUGH. I have had some SERIOUS gym FOMO this week and I know it won’t get any better through the next week until I am cleared to getting movin’! Even then, it is a solid 5-6 weeks until I can lift or crossfit. That is a LONG time… Especially in the gym world. So where has this left me? Issues can happen to anyone. Endometriosis is more likely if it is in your maternal line (which it is for me). Having this come about does NOT mean I was not living healthy. It is not something to feel shame for. It IS something that happen. It IS something that was properly dealt with. It IS something that can be monitored and I DO have the control and ability to continue to live a healthy lifestyle and do everything I can to maintain my otherwise good health. Moral of the story… Living a healthy lifestyle will always win over an unhealthy one. Eating clean and working out is always a better choice over eating crap and being sedentary. But things may come up. Things may happen. What’s your best defense? Learning the ways to battle these things. Learning what your body likes and doesn’t like. Learning what kind of reactions your body, your individual self, has to all kinds of food. Every BODY is different. Every body reacts differently to all things, all environments. Learn what fuels your body, gives it what it needs, and lets it run on clean energy. Learn what your body rejects, what makes it feel like crap, what makes it susceptible to disease and illness, what unnecessarily challenges or disables your immune system. Know your body. LOVE your body. Love it in every condition.